Venus and Jupiter on the morning of August 19, 2014, when they were 1.2° apart at 5:35 am EDT, 40 minutes before sunrise at 6:15 am EDT. Venus is now below Jupiter after their close conjunction on August 18th (which I regrettably managed to sleep through). Taken from Maple Shade, NJ, with a Canon 6D digital SLR camera (on a fixed tripod) and a Canon 100 mm f/2.8L macro lens, then lightly cropped. Exposed 1/10 second at f/4, ISO 400. Mouseover for labels. Venus and Jupiter are converging above the eastern horizon on the morning of August 15, 2014, when they were just under 3° apart at 5:26 am EDT, 46 minutes before sunrise at 6:12 am. They will continue to converge until the morning of August 18th when they reach a minimum separation of 16 arc minutes for observers in the Delaware Valley (the closest appulse was 12 arc minutes at 1:11 am, more than several hours before they rose here) . They will then move apart as Venus drops towards superior conjunction with the sun on October 24, 2014, and Jupiter continues to climb away from the sun after its conjunction on July 25, 2014. Taken from the former Mart site in Pennsauken, NJ, with a Canon 6D digital SLR camera (on a fixed tripod) and a Canon 100 mm f/2.8L macro lens. Exposed 1/40 second at f/2.8, ISO 800. Mouseover for labels. On July 12, 2014, while taking a walk at Boundary Creek Park in Moorestown, NJ, this scene presented itself. The sun was partially blocked by by a passing cloud, which resulted in shadows of the cloud being projected into the hazy sky. Correspondingly, bright sunbeams emerge between the shadows, most prominently above the cloud, but below it too. The shadows and sunbeams seem to emerge in a radial pattern, but they're actually parallel and the radial pattern is due to perspective. Commonly called Crepuscular Rays, they're really just sunbeams. They only become crepuscular when they appear during evening dusk or morning dawn, since crepuscular is just a colorful adjective for things "occurring or active during twilight," when the source of the rays, the sun, would not be in sight because it's below the horizon. Taken with an Apple iPhone 5s at 6:27 pm EDT (2 hr 2 min before sunset at 8:29 pm). Camera set to 4 mm focal length; exposed 1/13,700 second at f/2.2, ISO 40. Brightness and contrast lightly adjusted with Windows Live Photo Gallery. On the morning of June 24, 2014, Venus and the 9% illuminated crescent moon were just 2° apart at 5:21 am EDT (11 minutes before sunrise) when this picture was captured from Maple Shade, NJ. The moon is a little less than three days (2 days, 22 hr 47 min) from new on June 27th at 4:08 am EDT. Taken with a Canon 6D digital SLR camera and a Canon 70-200 mm f/2.8L zoom lens set to 190 mm focal length, then cropped to about half its original dimensions. Exposed 1/400 second at f/4, ISO 400 (automatic exposure, handheld). The Solstice occurred 6:51 am EDT on June 21, 2014, marking the start of Summer for the Northern Hemisphere (and giving us the longest span of daylight for the year). This picture was taken six hours later (12:51 pm EDT) on the Analemmatic Sundial at Boundary Creek Park in Moorestown, NJ. At solar noon on the June solstice (nominally 1:00 pm daylight time), sol reaches it's highest altitude of the year (≈73.5°) for this location at 40° north latitude (40°00'36" to be exact). As a result, shadows are at their shortest. Notice the tip of the photographer's foot (a bit of red sole) at the bottom edge of the frame. Apple iPhone 5s, 4 mm focal length; exposed 1/2740 second at f/2.2, ISO 32. The picture below is a broader view of the sundial. One stands on the appropriate month and your shadow aligns with the current time. Note that this sundial is built with markers for both standard and daylight time (the outer and inner arcs respectively). I haven't paid much attention to it lately, but on the morning of June 18, 2014, I couldn't help but notice the planet Venus shining brightly in the east on the way home from a late night at the office. Although it's now three months past Greatest Western Elongation on March 22nd (and four months until Superior Conjunction on October 25th), Venus is still blazing at magnitude -3.9. This image was captured at 4:40 am EDT when it was just above the treetops at 11° altitude, roughly an hour after it rose at 3:39 am. Astronomical twilight started at 3:28 am and sunrise would be at 5:31 am, about as early as it gets at this latitude. Taken from the edge of the Moorestown (NJ) High School athletic fields on Bridgeboro Rd near Westfield Rd with a handheld Apple iPhone 5s at 4 mm focal length. Automatically exposed 1/15 second at f/2.2, ISO 2500 (with the flash turned off). Besides size reduction for this web page, no processing was applied (yes, it's a bit noisy). The summer Milky Way was a backdrop for the much-anticipated Camelopardalid meteor shower (potentially a "storm") on the morning of May 24, 2014. However, this image is typical of the 350 or so that I took showing no meteors. Furthermore, few were seen visually by this observer (half-a-dozen unimpressive meteors, two of which were perhaps Camelopardalids). The image above was captured at 2:51 am EDT, looking south towards Sagittarius and Scorpius, which are just above the tree line at Belleplain State Forest in Cape May County, NJ. Taken with a Canon 6D digital SLR camera (on a fixed tripod) and a Sigma 14 mm, f/2.8 lens (Nikon mount with a Fotodiox adapter), which provides a 104° wide × 81° high field of view on the "full-frame" sensor. This is a single exposure of 20 seconds at f/2.8, ISO 3200 (mouseover for labels). Following the meteor path back to the upper left, it passes just northwest of the bowl of the Little Dipper, which pretty much crosses the radiant derived from the several meteor streaks in the Astronomy Picture of the Day for May 25, 2014. This is about 15 degrees northeast of the radiant predicted by most sources (e.g., the American Meteor Society has 8:08 hr RA and +79° Dec, or look at the radiant marked on the chart at the previous cited S&T article). Same camera and lens as the previous image, but this single image was exposed for 30 seconds at f/2.8, ISO 3200. Note that because of the considerably wide angle of view produced by this camera and lens combination, some distortion of the field occurs. The image below is a 15% (linear) crop of the meteor area in the previous image, equivalent to an approximate 95 mm focal length. The meteor is passing between Epsilon and Sigma Draconis (left and right of the streak, 1.5° apart and magnitude 3.8 and 4.7 respectively. The meteor streak is only about 4.5° long (mouseover for labels). 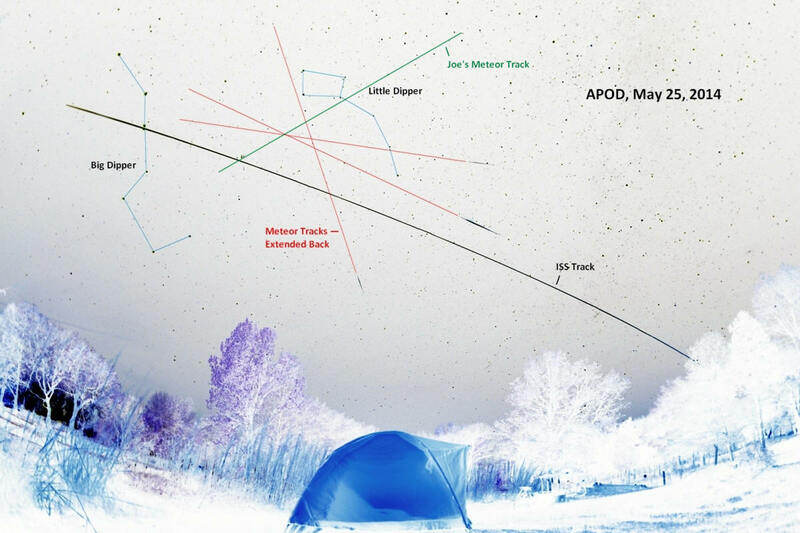 Below the close-up crop are (1) a SkyTools chart with the meteor track drawn on it and (2) a cropped negative of the May 25th APOD with three Camelopardalids; the tracks leading back from them are drawn in red, plus my meteor track drawn in green. The tracks on the APOD are probably a little off because of distortion from the very wide angle lens used. Finally, I've also tabulated the exact number of exposures — 364, not including 12 test frames to set/check aim, focus, exposure and color balance (thanks to Jerry Lodriguss for assistance with the color balance settings on these JPEG images; he also provided a dew heater after I discovered the bulbous lens fogged over, at which time I switched from the Summer Triangle overhead to the Sagittarius Milky Way towards the south). There were 114 frames of the Summer Triangle region taken between 1:01 and 2:09 am EDT (68 minutes of 30-second exposures), and 250 frames of the Sagittarius region between 2:19 and 3:54 am EDT (95 minutes of 20-second exposures). Note, there were a few seconds of lag time between exposures, which were triggered by a Yongnuo TC-80N3a wired remote control intervalometer (exposure duration was controlled by the camera).